Madu Ganga is considered by many as a silent river compared to others, perhaps due to its shallow waters, but do you know that its the second largest wetland in Sri Lanka? After a few minutes since starting off our journey we came across the railway track that ran from one island to the next over Madu Ganga. The boat ride on Madu Ganga was a pleasure, more so because of the blue skies and blue water which drew my full attention. Along the Madu Ganga on either side were plants, flowers and birds. We also passed nearly ten boats which had both Sri Lankans and foreigners coming to cruise along Madu Ganga. Each boat can take ten people. 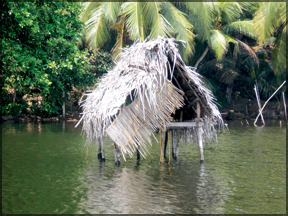 Madu Ganga is considered as Sri Lanka’s second largest wetland consisting of 62 islands including two main islands providing shelter for 480 families. 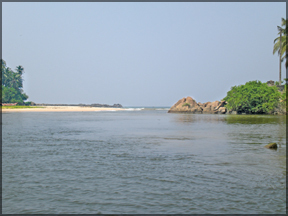 It is a shallow water body in southwest Sri Lanka, which enters the sea at Balapitiya. The Buddhist Amarapura Nikaya sect had its first upasampada (higher ordination ceremony) on a fleet of boats anchored upon it in 1803. Along with the smaller Randombe Lake, to which it is connected by two narrow channels, it forms the Madu Ganga wetland. It was not just a boat ride but also one which enabled us to acquire some different experiences too. People who live in these islands earn their daily bread by showing off their pets such as baby monkey or some such similar animal. A half hour later we came across the bridge on which buses ply from Balapitiya to Wathugedara. The first island that we set foot on was called Cinnamon Island, consisting of four acres. The family living there showed us how the cinnamon product comes out for our meal and the process of clearing the cinnamon sticks, which is rolled and dried on the roof. It is a good opportunity for school children to learn how some ‘island folk’ live. Madu Ganga has a high ecological, biological and aesthetic significance, being home to 303 species of plants belonging to 95 families and to 248 species of vertebrate animals. 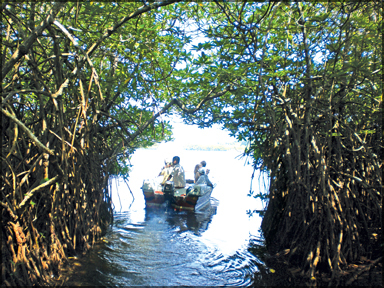 It is possibly one of the last remaining tracts of pristine mangrove forests in Sri Lanka. 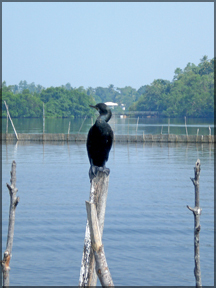 The Wetland was declared a World Heritage Site in 2003, in terms of the Ramsar Convention. 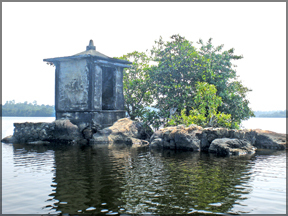 “Nai Duwa is the highest island on Madu Ganga. 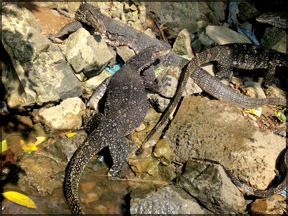 There are many snakes in this island and if villagers capture snakes they let them loose on this island,” our boatman Nalinda Kusum Rajasinghe said. 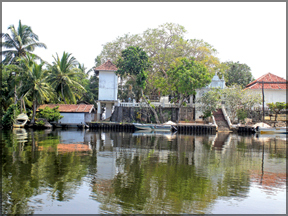 Another small islet described as Satha Pahe Dupatha has a nearly 800 years old Dewalaya but without a statue of a god today. Maduwa is the largest island on Madu Ganga with a total length of 562 metres. There are nearly 380 families living in Maduwa and it has two temples, a hospital, school and a post office too. Koth Duwa has a temple which is called Kothduwa Raja Maha Viharaya. The Buddha statue there may be the highest statue that stands on the island. There are five monks living at this temple and its’ bodhiya is said to be around 800 years old. 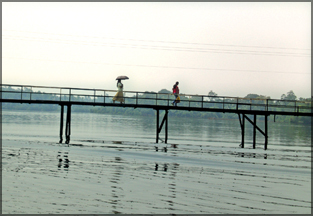 It is claimed that the main secret of the Madu Ganga is the tide. On any given day during the low tide the sea water comes inland and mixes with fresh water in the evening, and vice versa, creating the magic of nature. In earlier years Madu Ganga and its islets were renowned for their mangroves, but these are now increasingly under threat. 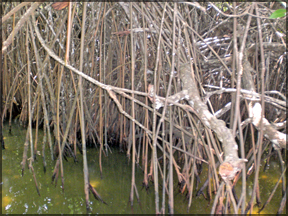 Kirala trees also abound in the mangrove habitats. Their juicy fruit can be eaten raw or made into a delicious, nutritious beverage. 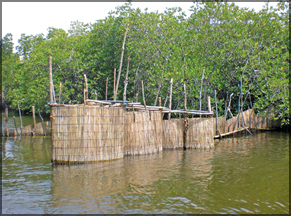 The other mangrove species thriving there are the Karan Koku which can be cooked as a curry or mallun. At Diga-duwa (Long Island), one is able to identify several herbal plants. Another valuable herbal plant Kothala Hibatu, the roots of which are used in Ayurveda medicine as a cure for many diseases are also found. 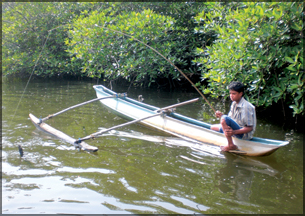 Another common plant that thrives along the fringes of the Madu Ganga and its islets is Wal Beli. Another rare tree we were shown was called Rath Milla. 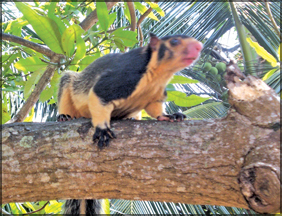 On the banks of the Madu Ganga and its islets are a few groves of Gin Pol which is a mangrove species, with leaves in the shape of the coconut palm. Its fronds are used for thatching roofs. 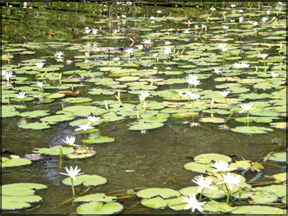 Mangroves apart, the most alluring aquatic plants that greeted us on our river journey were the beautiful manel and olu - of varied hues. The rathu manel, nil manel and sudu olu were in full bloom and looked like carpets. It was easily my most favourite place on Madu Ganga. Blue Water Hotel at Wadduwa has been one of the better known hotels along the Southern coastal line mainly because of its beautiful setting giving the guest the illusion of the sea blending into the swimming pool and the hotel itself. Designed by Sri Lanka’s foremost architect Geoffrey Bawa, Blue Water is a one hour’s drive away from Colombo along the Galle Road. The attraction of Blue Water Hotel is more because of these two colour combination which have been used for exterior designing. Long corridors with tall white pillars give cool sight to the guest who spend their holidays at Blue Water Hotel. 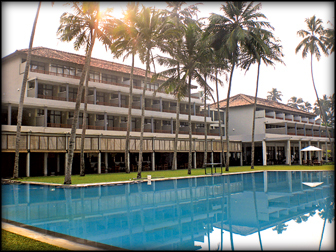 “The hotel has a very good demand from Sri Lankan and also UK, Russia, and Germany. We are also planning to renovate and upgrade hotel rooms next year. We already operate theme nights and we are going to introduce special food promotions on National Days dedicated to other countries. We have already had such promotions as Thai, Myanmar, Australia, Cuban, Indian, Kuwait, Iran, Pakistan and Bangladesh Days. Guests can look forward to some colourful events,” said General Manager of Blue Water Roshan Perera earnestly. As excursions, guests can visit Madu Ganga, Kalutara Bodhiya, Rankoth Viharaya, Turtle Hatchery, Lunu Ganga and Bevis Bawa’s Garden too. Except these expeditions guests can take part in Squash, Table Tennis, Badminton, Billiards and Volleyball at the hotel premises. There is a fully equipped gym at Blue Water and individuals too can receive membership of the gym. The coffee shop is called ‘The Seven seas’ and guests can taste and sample fine teas, fresh coffee or any number of the delightful treats on offer. Blue Water has a large swimming pool which perhaps could also be rated as one of the biggest swimming pools in the country. There are palm trees around the swimming pool giving a serene atmosphere to the hotel. This hotel was managed by the Jetwing Group for the past 11 years till it was taken over by Union Resorts Ltd from 1st of May this year. “Four months ago we opened our new banquet hall which can accommodate 600 pax making it the biggest banquet hall in Sri Lanka. We invested nearly Rs250 million to construct this new banquet hall,” said Assistant Manager Sam Samarasinghe. Blue Water Hotel is undertaking many foreign wedding ceremonies on Sri Lankan traditional themes, Kandyan dancers and elephants. Designed using natural materials and textures the atmosphere at the Blue Water Spa offers many kinds of treatments according to the guests’ wishes. The shape of the spa is a bunker and the roof covers the grass. This hotel has 96 deluxe rooms and four Suites with each room having its own terrace or balcony and all are with a view of the sea. At the Reception, the white wall has a black painting depicting a big snake. It is a beautiful picture and there are some pillars with devil’s masks appearing inside of the snakes’ picture. This drawing of snake has seven heads and at a glance delights the guest who enters the reception.